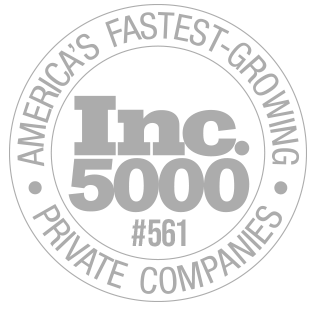 Last week, Inc. notified us that we made the Inc. 5000 list for the second year in a row, making us one of the fastest growing companies in the U.S., again! In 2017 we were ranked #820, and in 2018 we climbed to #561. I remember a moment when our company was stagnating. We had a healthy business, but the reality was that for a period of time, it felt like we were just humming along in circles. This is a common problem in many organizations. Sure, you want growth, but daily actions may not reflect that (or contribute to it). It’s easy to get sucked into a routine of checking email, attending meetings, and doing busy work that seems worthwhile- but doesn’t make an impact on growing the business. Now, having a comfortable, healthy business that’s chugging along is a good thing to have. But to me, that can also bring along an underlying killer: Complacency. You see, the ENEMY of growth is complacency. If things are bad, you change. But if you’re complacent, you’re stuck. I’m a firm believer that growth should be the goal. If you are truly doing something good in your market, it’s your moral responsibility to help as many people as you can to the best of your ability. …And even more importantly, you give your employees a vehicle to grow personally. Everyone that’s working for you wants the opportunity to further their career, and when you make growth your goal, your team gets better too. When they grow, they help you grow. In turn: that helps your customers even more. Action: Take a good look at your day and judge whether your actions are helping you to reach more customers, better help your customers, or sell more to them. If not, then change your daily habits and make growth your main focus! Somehow I hear phrases like, “We didn’t spend a dime on marketing!” as if it’s something to be proud of. To be blunt: I think that kind of mentality is just plain stupid. Running a business is about making ROI – not spending zero dollars. If I spent a million bucks and made 2, I still made a million bucks. I’m a big fan of being a multi-channel marketer. There isn’t “one” marketing channel that you should put all your eggs into. Just as each channel can be a goldmine, they all have inherent risks as well. For a majority of marketers, investing in SEO is one of the BEST starting points. SEO isn’t a one-channel investment. You can take advantage of multiple channels by turning every explanation you provide to your customers into content such as an article or video. This could be how your product, service, or industry works, or the answer to every objection and question. Turn it into a piece of content (or better yet, a video too). Each one of these content pieces will become little marketing soldiers that keep working for you 24/7 for YEARS. This is an SEO strategy (Optimize them to rank in Google). This is a CRO strategy (Ask for opt-ins throughout the content and link them to your sales pages). This is a paid traffic strategy (Run ads to them). This is a social strategy (Post them on social and discuss). This an email marketing strategy (Put them in an autoresponder and drip them out). Promoting content across multiple channels in this way will make your prospects understand you. It will position you as an authority…and it will make closing deals 10000X easier. By investing in SEO & content first, you get the assets you need to start marketing in nearly every channel. Content is the core of it. Action: Start investing in SEO by creating useful content, use all other forms of marketing to amplify that content. (P.S. Need some help with content? We got you, fam). Depending on what stage of business you’re running, you’ll want to do different things. Each year we’ve grown, we wrote about what we were thinking about at the time. When we were in the early stages and got our first 10,000 users, we wrote an article about staying lean, getting to profitability quickly, and making a first big jump in sales. We began investing in marketing and focused on creating a system that automatically brings in customers and develops a relationship with them. See the blueprint article here. Then we grew to have our first $1mm month and we wrote this article about how important it is to build a solid company culture. Every step of the way had new challenges and things to learn – but that’s the point. It’s what made it exciting. Action: Revel in challenges, use hard times to gain strength. Read HOTH articles and implement like a madman. Once you’re growing and having the time of your life, apply for your awards! The Inc 5000 application itself isn’t that hard – you just need a few financial statements. You DON’T have to be a multi-billion dollar company. It’s based on 3-year growth, not by being the biggest ever. 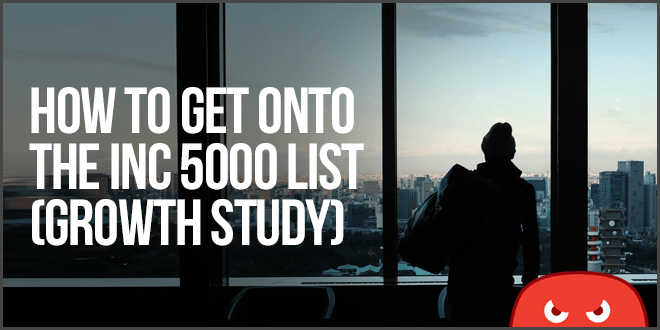 Action: Apply for the Inc 5000 when you hit the requirements. While you’re at it, go ahead and get yourself some awards from your local newspapers too! You have to dream it fist for it to come true. Make growth your goal and invest in it. This will set off a chain of events that will change everything for you. You can see last year’s announcement from when we first made the list here. Its really inspiring to be reading such articles, especially when I am a DIY seo just trying to rank my own site. My current aim is to be able to generate enough profits so I can engage your services! LMAO! me too, I wondered what make me subscribe but I have no regret. Guys, You know what? I’m bookmarking this page straightaway! I want to see my company at the top. I want to know how a new website should do SEO strategy so that they can improve in the SERP results. Please guide me on this. Thanks for a great article. I do agree with you that investing in traffic is the right thing to do. I’ve been studying everything about investing in the right traffic source to get a good ROI. I like your helpful tips about investing in it the right way. Thank you for the comment Raheela! Dream Big!